Today I bring you another card featuring some retiring products. Featuring Boys Will Be Boys. This card is incredibly quick and easy to do. It uses just one stamp set - Boys Will Be Boys. And only minimal supplies. The lego bocks are stamped straight onto the base card. Then coloured with an aqua pen and ink pad. The red card stock was cut just a tad smaller than the white card stock and then the blue card stock cut smaller again. Then the two circles were cut out but the top one offset. 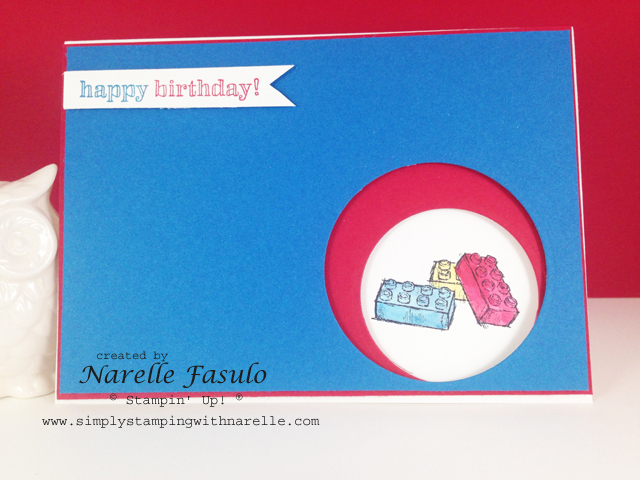 Happy Birthday from the same stamp set was coloured with markers and then cut into a banner. Don't forget that the retiring products are selling fast. So make sure that you grab your favourites before they are gone for good.